Dundee was a major centre for early railway construction. By the late 1840s there were o less than three railways with termini in Dundee. All three were originally built to different gauges. The Arbroath & Forfar line opened in 1839, and it soon was possible to travel from Dundee to Forfar without the need to change trains. The railways on Tayside made their money from a combination of transporting agricultural materials and passenger traffic. 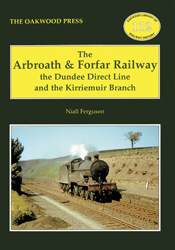 The Arbroath & Forfar Railway was soon taken over, but its position on the principal route between Glasgow and Aberdeen ensured that at least part of its line remained open until 1967. The Kirriemuir Branch services tended to be centred on the Forfar-Arbroath-Dundee axis, so it has been decided to include this as well as the Dundee to Forfar Direct line, which opened in 1870. The latter resulted from a desire to avoid the circuitous route from Forfar to Dundee via Arbroath, but it was always something of a backwater. The book is A5 format, has 240 pages and more than 150 photographs, plans etc.